The largest portion of the brain is the cerebrum, which controls a large variety of higher functions such as abstract thought and language. It forms the outer lobes of the brain, which are discussed further bellow. Broadly speaking, this region of the brain is divided into two hemispheres, which may communicate to each other via the corpus callosum. The outermost layer on the surface of cerebrum is known as the cortex. This is a region of grey matter (which contains mostly cells bodies, as opposed to white matter, which is mostly axons) where most of the actual computational processes takes place. The thalamus collects sensory input from all over the body and transfers that information to other parts of the brain. It is especially important as a 'relay' station between the cortical regions that process sensory information and lower regions of the nervous system where that sensory information originates. It also has embedded in it several nuclei with functions ranging from sleep to motor control. It is located near the center of the brain, with one thalamus in each hemisphere. The hippocampus is crucial in the formation of memories and also plays a role in emotion. 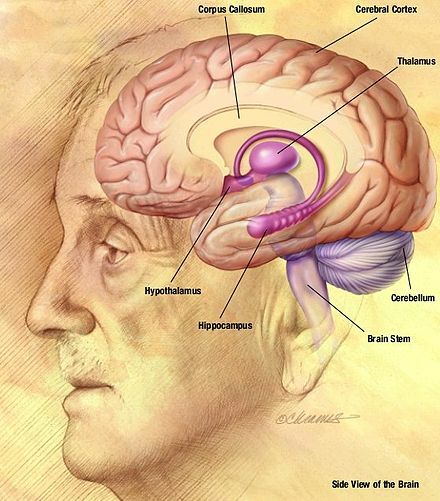 Just like the thalamus, there are two hippocampi, one on each hemisphere of the brain. Although not a region per se, the limbic system is a group of closely interlinked brain regions which are heavily involved in emotion. One important limbic subregion is the amygdala, which is best known for its role in fear and aggression. The limbic system also encompasses the hippocampus, meaning it also has a strong relation with memory, especially wherever memory and emotion collide. The hypothalamus regulates the secretion of most of the body's hormones via the pituitary gland (which is what, for the most part, actually creates those hormones) and thus controls a large number of vital bodily functions, including body-temperature, hunger, sexual, and autonomic responses. It lies in the center of the brain, between the two thalami. The cerebellum controls motor coordination and balance all across the body. Other motor-related functions of the cerebellum are posture, motion precision and timing, and motor learning. It projects off the lower back of the brain. The brainstem includes several regions that modulate functions absolutely vital for survival such as breathing and blood pressure. Among the three main brainstem structures are the midbrain, which is, among other things, associated with sleep and alertness, the pons, which has many white-matter tracts connecting the brain to the neurons of the body, and the medulla, which is responsible for most of the essential autonomic functions mentioned earlier. The occipital lobe handles visual information and is located toward the back of the brain. The frontal lobe is responsible for most of the most complex functions humans are able to complete, such as thought, planning, rationality, and judgment. It makes up the frontal part of the brain. Эта страница в последний раз была отредактирована 13 ноября 2017 в 23:40.